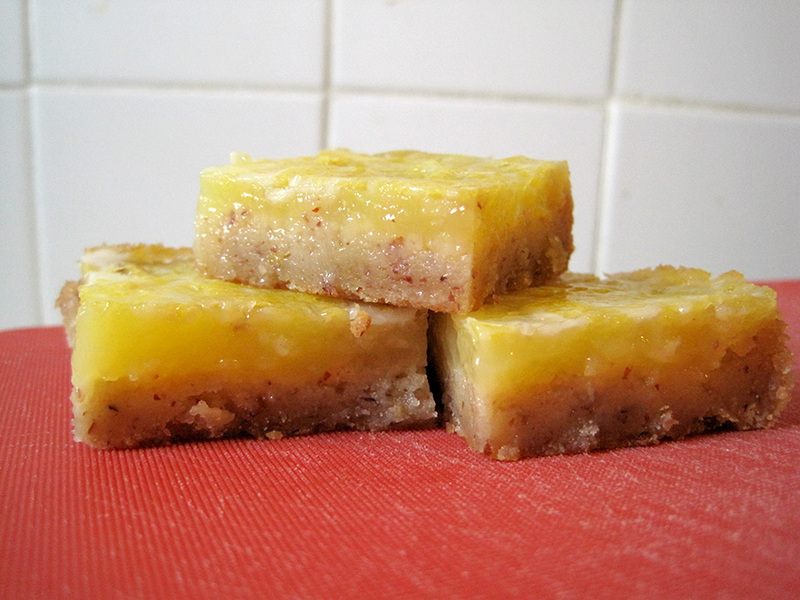 The heralding of what might finally be spring has spurred me to make something light and summery, like these lemon bars. I’m typically much more of a chocolate person, but I do have to appease the warm-weather gods by baking up an offering. 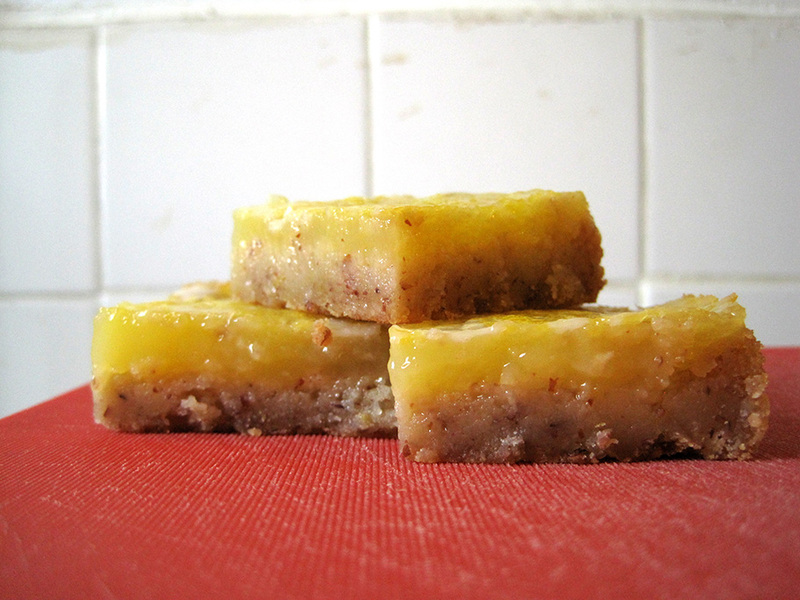 These bars turned out to be just the right balance of sweetness and tartness, but I did alter the recipe quite a bit. For the filling, I used three jumbo eggs instead of four regular sized eggs. I also didn’t have enough lemon juice, and I didn’t use Meyer lemons. I just used what was in the supermarket. I clearly didn’t mix the egg up enough, hence the splotchiness, but it didn’t affect the taste at all. I reduced the sugar to compensate, but I entirely eyeballed it. Then for the crust, I decided to do a spinoff of this almond crust I made for a key lime pie, subbing half the flour for almond meal. It turned out pretty darn good overall, despite my slightly haphazard approach. Preheat oven to 350F. 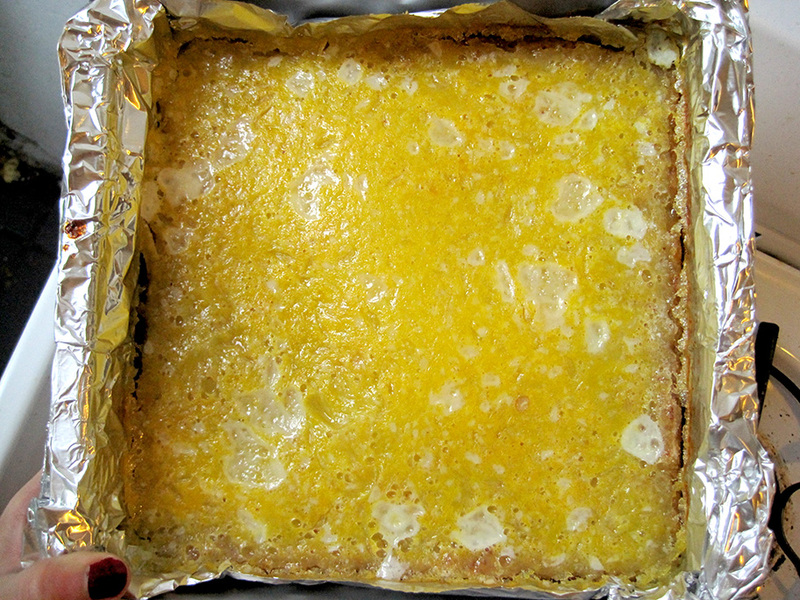 Line 9×9-inch baking pan with aluminum foil. Make the crust. In a large bowl, whisk together flour, sugar, salt and lemon zest. Cut butter into chunks and add to flour mixture. Blend in with an electric mixer at low speed until mixture forms coarse, sandy crumbs. Pour into pan and press mixture down (with your fingers or the back of a spoon) into an even layer. When the crust is almost done baking, with just 1-2 minutes to go, make filling. Whisk together all filling ingredients in a large bowl. Do not let the filling mixture sit around on the counter while the crust bakes. Bake for about 20 minutes, or until filling just barely begins to turn golden at the edges. It may appear very wet, but filling will continue to set as the crust cools. Allow to cool to room temperature, then, when bars are completely cooled, refrigerate for at least 1-2 hours before slicing.